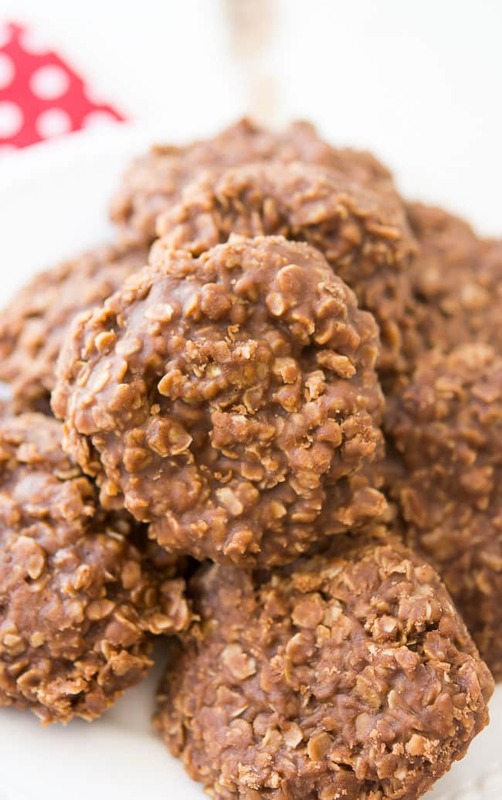 It seems like these classic, chocolate no-bake cookies have fallen out of fashion since my childhood during the 80’s and 90’s. Well, I’m doing my part to contribute to their revival in popularity, because while no-bakes are definitely easy and familiar, they’re also incredibly delicious every single time you make them! There is something to be said for that, you know. 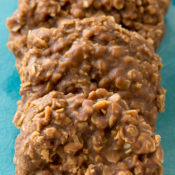 There are certain cookie recipes that we make again and again, and this chocolate no-bake cookies recipe is one of them. 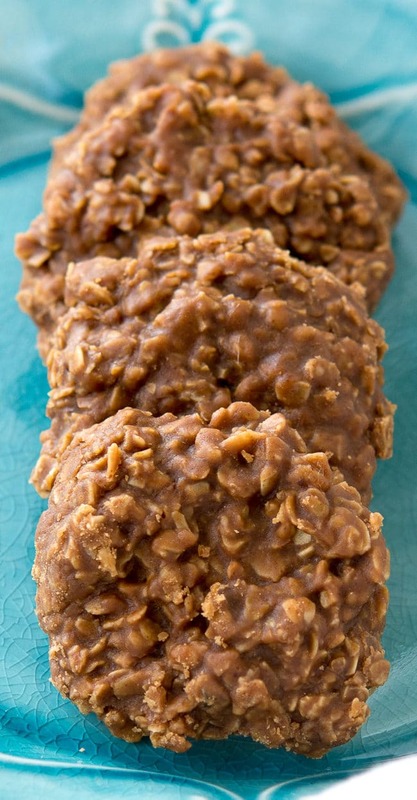 You may be familiar with my famous peanut butter no-bake cookies (well, they’re famous in my house), which are also delicious in their own way. 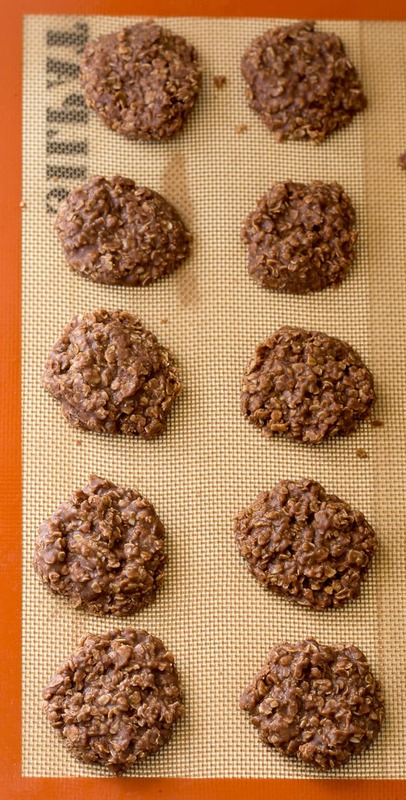 What can I say, I am truly a fan of old-fashioned no-bake cookies like these. They just never get old for me. 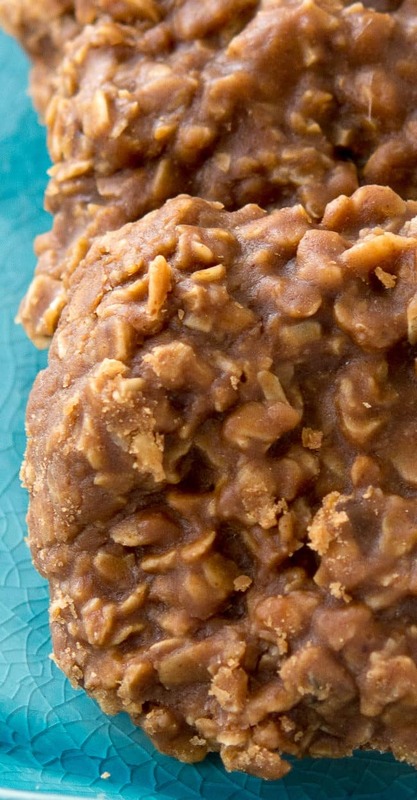 The thing with making these type of no-bake cookies is that your results may vary. 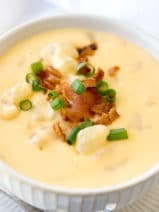 It’s really important to pay attention to the the boil-time, and to try to stick to what it says in the recipe for best results. That’s not to say it’s hard to get it right, because it’s really not, just don’t over or under boil it. When I was a kid, I associated chocolate no-bake cookies like this with community bake sales. 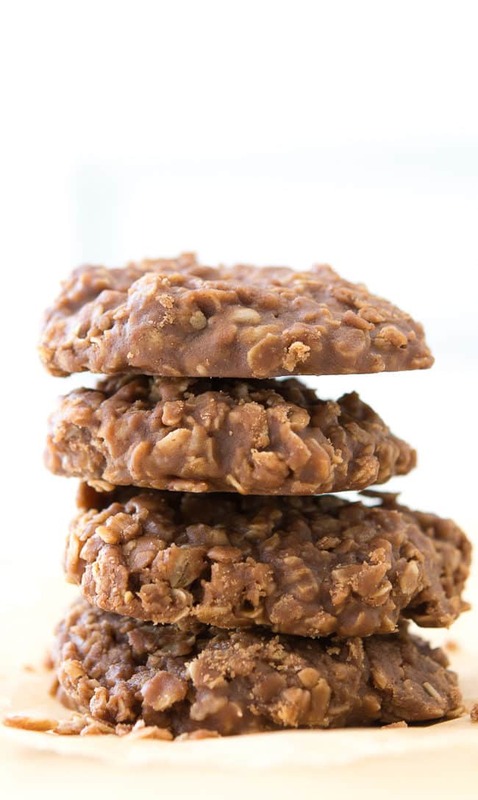 It’s funny when I think back to those bake sale tables, because there were usually two or three different versions of no-bake cookies, each individually wrapped in plastic baggies. The other popular bake sale fare of the day were Rice Krispies Treats! 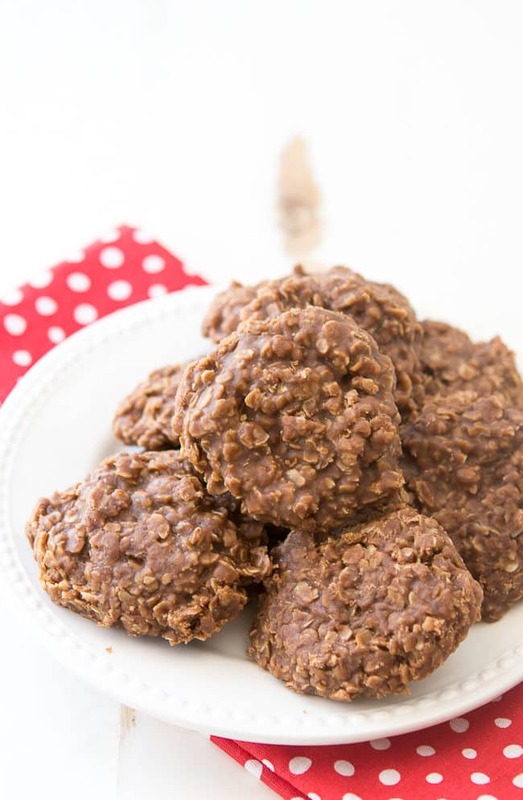 If you haven’t had chocolate no-bake cookies in years, I invite you take a stroll down memory lane and try this great recipe. I think you’ll find that these cookies taste even better than you remembered. Get the printable recipe below, and be sure to pin these yummy chocolate no-bake cookies to your favorite dessert recipes board on Pinterest! Psst… I also make the best chocolate chip cookies EVER. Don’t miss those! In a medium saucepan over medium-high heat, combine the sugar, cocoa, butter and milk. Bring to a rapid boil and boil for 2 minutes stirring continuously . Remove from heat and stir in the vanilla and the peanut butter. Stir in the oats until blended then immediately drop by tablespoons onto waxed paper. Let cool until set. Can you use chunky peanut butter? Hey Kara, I think it could definitely be the fact that you used the natural peanut butter. It always seems a little oilier to me? With that said, these cookies don’t get “hard”, but they should also not be sticky to the touch. Might want to try it again with the regular peanut butter if you like the flavor! :) Thanks for commenting, and I love your name! It’s my little girl’s name! can you use natural peanut butter??? Can these be made with Splenda instead of the sugar? I am a diabetic and need to cut the sugar. 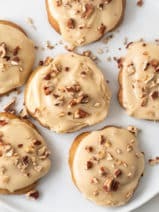 Diane, my mother used to make a version of this recipe without peanut butter as well. Let stand, then put by teaspoon full on wax paper..
plenty fine with the peanut butter, I have been longing for the just choc version for a while now. 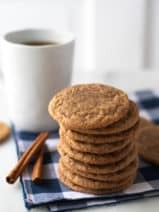 See, my mom passed away in July 2010, and I think the longing has to do as much with really missing her friendship and guidance as with wanting the taste of those cookies. So, Chrissy, will you please let me know what, if any, adjustments I might need to make to the dry ingredients. I’d be greatful for your response. Thanks so much, Diane Z. 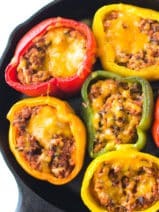 Can I use margarine in this recipe instead of butter?